OAKLAND - Mayor Jerry Brown has vowed to lift the arts in this city and that's good news for African - American artists - many of whom have struggled to showcase their talents. 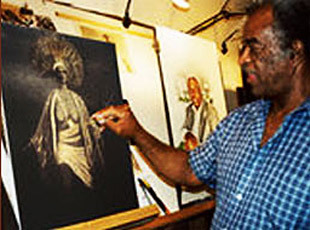 Towering above many in the Blacks Arts world is an African-American man whose name is as unusual as his artwork. Meet TheArthur Wright. Not The Arthur or The-Arthur. It's TheArthur. One word, and one heck of an artist. When his powerful art graced the windows at the Alice Arts Center, folks stopped, smiled and wondered who could have created these works. Q: You are well known in art circles, but maybe not to many novices. Who is TheArthur and what are some of your passions? A: I have just turned 61 years of age this month. I was born in Little Rock, Arkansas. No particular hobbies except for the pursuit of art. I have great interest in creative and scientific things and stay abreast of current affairs. Q: How or why did you get an interest in art, when? A: Since early childhood I have been interested in doodling with art and writing dating back to before my school years. I was fully able to read and write prior to kindergarten. Q: Describe your creative process? A: Watercolor is one medium and process that I have long used and household bleach as another but only for the last five years. Bleach on certain papers creates a bright gold residue and I can manipulate that to create my images. Q: Describe your artwork or area of focus? A: I am interested in portraying African derived historical figures, be they African or African American. Or in general any ethnic figure, since daily it is becoming a lesser contended fact that life and the human race began there. Q: What's been your biggest setback? A: In the early years it was just that, my earlier years. As maturity has set in my staying power has increased. Q: What's been your biggest success? A: Having my work placed in a half-dozen countries and also being on the Board of Directors of the Artship Foundation. Q: What makes your art unique? A: At the present time it is because I use common household bleach to render my art figures. Also I am a pointillist which is a time consuming style but it enhances my art. Q: How have people reacted to your work? A: With astonishment that an item such as bleach can even be used as an art medium or with such precision. Q: Where has your work been showcased? Next venues? A: as I mentioned before I can safely say I have pieces in various countries and that kind of takes my breath away, it’s like the first basket I made in a high school game, coming off the bench, the pride was enormous. In these latter days I have been shown and purchased as far away as New York, Seattle, LA, places in between, but the most satisfying was Johannesburg. Oh, yeah, and Berlin, London, and I think, Tokyo. They were bought here in the Bay Area. I forgot, Sweden. Q: What piece was most challenging? Most rewarding? A: They all present certain challenges of course, but a watercolor piece, 'Descent to Rome,' would probably qualify in both cases in that it led to my using bleach. A watercolor problem was solved and at the same time suggested that bleach would be an effective and somewhat spectacular medium.